Only time will tell whether Google has succeeded in building an evolutionary advantage. But consider: Since it’s founding, it has repeatedly morphed its business model. Google 1.0 was a search engine that crawled the Web but generated little revenue; which led to Google 2.0, a company that sold its search capacity to AOL/Netscape, Yahoo and other major portals; which gave way to Google 3.0, an Internet contrarian that rejected banner ads and instead sold simple text ads linked to search results; which spawned Google 4.0, an increasingly global entity that found a way to insert relevant ads into any and all Web content, dramatically enlarging the online ad business; which mutated into Google 5.0, an innovation factory that produces a torrent of new Web-based services, including Gmail, Google Desktop, and Google Base. More than likely, 6.0 is around the corner. Of course Google may ultimately fall victim to hubris and imperial overstretch as it takes on Microsoft, Yahoo, eBay, the occasional telecom giant and pretty much everyone else in cyberspace. Or like Microsoft, it may simply become like every other big company as it grows. But that’s not the way I’d bet. 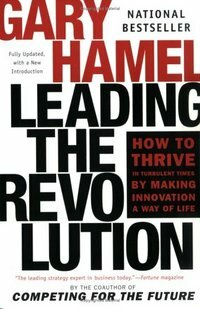 Google seems to have grasped the new century’s most important business lesson: The capacity to evolve is the most important advantage of all. Hamel, Gary. "Management à la Google." The Wall Street Journal (Weds., April 26, 2006): A16. Hamel, Gary. 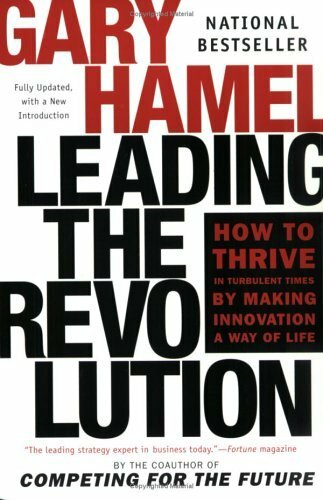 Leading the Revolution: How to Thrive in Turbulent Times by Making Innovation a Way of Life. Revised & Updated ed. Harvard Business School Press, 2002.